If you want to discover which subdomains your competitors are directing their PPC advertising traffic to the most, look no further than the Advertising Subdomains report. This report analyzes your competitor’s subdomains by paid traffic, paid traffic %, and the number of paid keywords going to each subdomain. 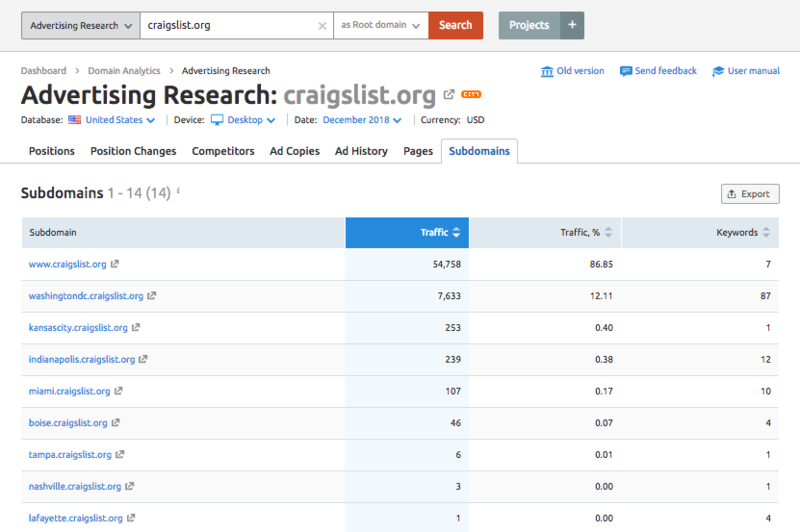 For example, if we query craigslist.org into this report, we can see which subdomains (each subdomain representing a different region in the US) are advertising craigslist posts through Google Ads. Much like the other reports within Advertising Research, you are able to expand on certain metrics by clicking on that respective data. In order to expand on the individual keywords linking back to a specific subdomain, you would simply just click on the number of keywords located in keywords column. This action can also be done with the traffic % for the subdomain. As always, you can export to CSV, Excel, or PDF to save this data to your research. Why is my estimated advertising traffic & cost different from my actual traffic and spending in Google Ads? How do I change the currency of my report?